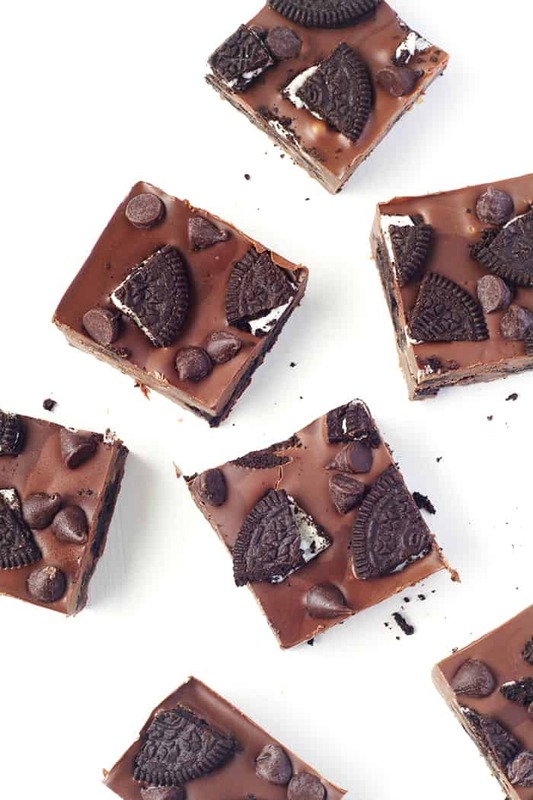 Chocolate + cream cheese + Oreos = THIS. And inside that thick coating of chocolate are sweet, buttery Oreo cookies that have been crushed and mixed with tangy cream cheese. 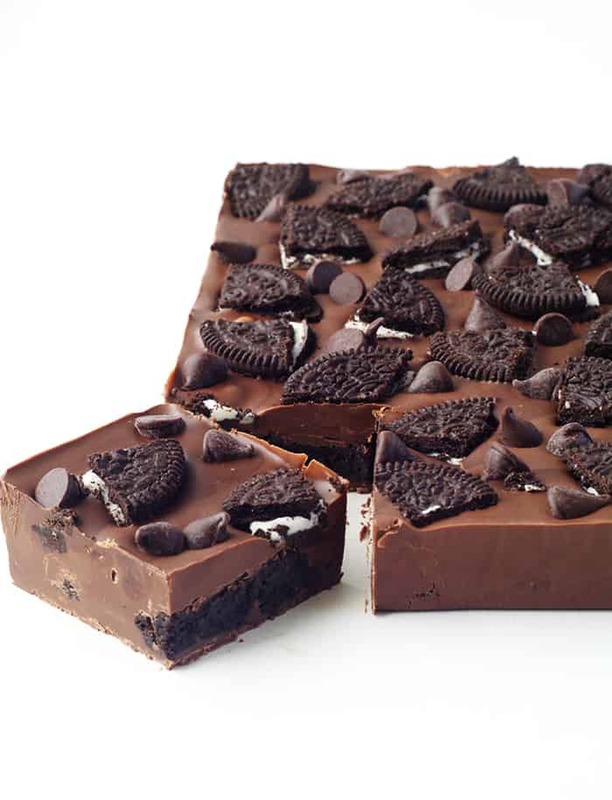 Add more Oreo cookies and plenty of chocolate chips on top and you have the ultimate Oreo Truffle Chocolate Bar. You (my lovely readers) often tell me how much you love easy recipes. Which is fantastic because I LOVE easy desserts. And trust me, it does not get ANY easier than this four ingredient treat. I need to warn you that this recipe is dangerous. First of all, it’s almost too easy. Second, it’s impossible to stop at one piece (or three). It’s definitely a treat that needs to be shared. All the Oreo lovers in your life will thank you. And you can also use whatever chocolate you like. The chocolate bar pictured was made from a mix of dark (semi-sweet) chocolate and milk chocolate. The white chocolate lovers out there could also try it with white chocolate for a little ‘cookies and cream’ action. Well the holidays are officially over and it’s back to work for me today. Yesterday we were able to make the most of the beautiful weather and spend the day at the beach – the best. The waves were a bit rough, so I was forever getting thrown about but it makes for some good laughs. 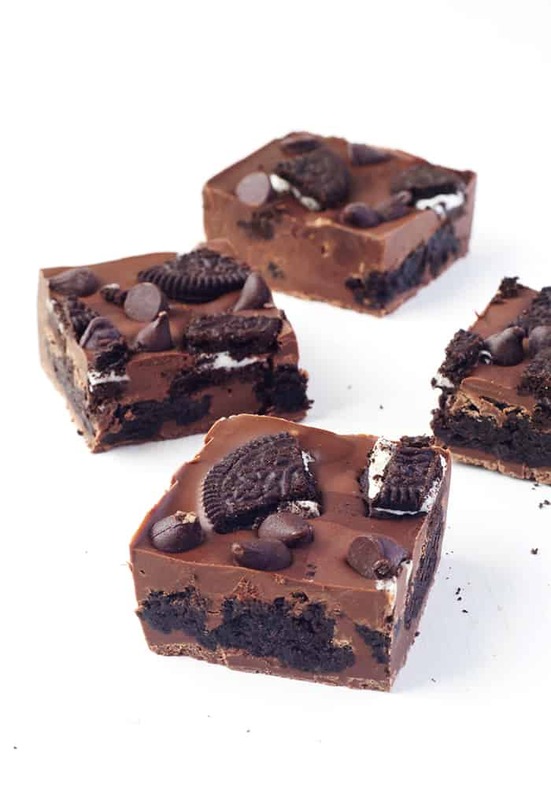 Sweet, buttery Oreo cookies are mixed with tangy cream cheese and covered in chocolate to create the amazing 4 ingredient Oreo Truffle Chocolate Bar! Line an 8 inch square tin with baking or parchment paper. 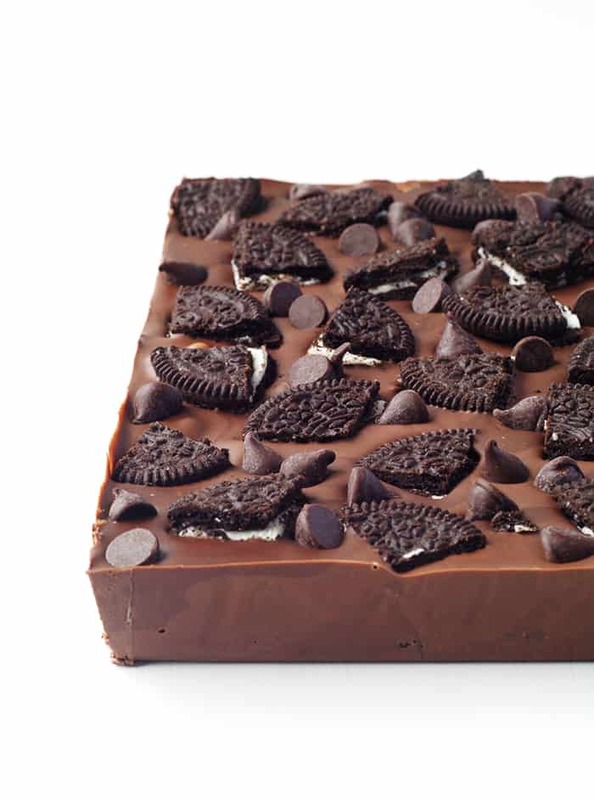 Set aside 100 grams (about 10 Oreo cookies) for decorating the top of your chocolate bar. Using a food processor, finely crush the remaining Oreo cookies (250 grams / 25 Oreo cookies). Add your cream cheese and whiz again. 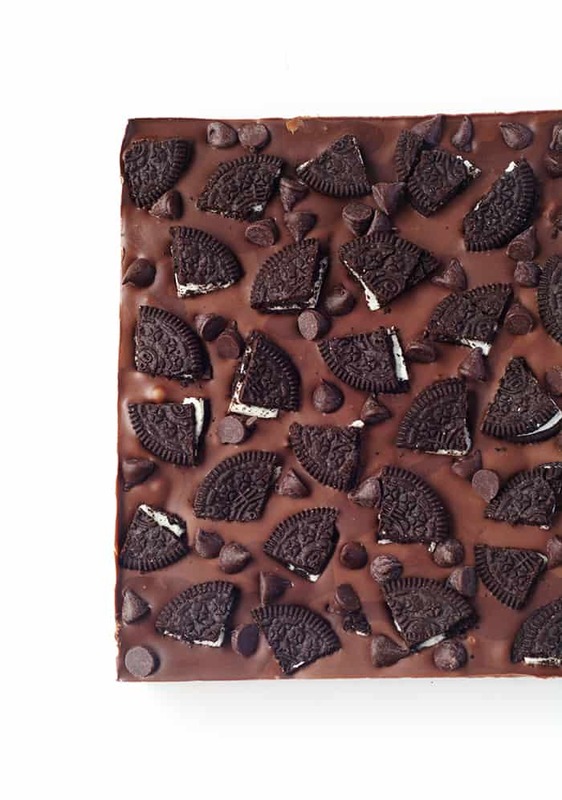 Pop the Oreo mixture into the fridge for 5-10 minutes. When you’re ready to assemble your chocolate bar, melt your chocolate in the microwave, stirring every 30 seconds, until just melted. Pour a small amount of chocolate into your prepared tin, spread it out using a small spatula, until the bottom is just covered. 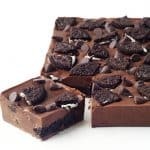 Then, grab a small handful of the Oreo truffle mix, flatten it out with your hands, until it’s about 1/2 an inch thick, and gently pop it on top of the melted chocolate. Continue with the rest of the Oreo truffle mix, until there are almost no gaps – but it’s ok if there are some! Pour over the remaining chocolate until the entire bar is covered. Add the extra Oreo cookies on top, then sprinkle over a few chocolate chips. Pop into the fridge for a few hours to set before cutting into slices. Hi Jessica , Should I use baking chocolate or is any chocolate Ok? Made your Oreo cheesecake several times, its amazing!! Hi I’m new to cooking and baking and am just a little confused where it says “450 grams (3 cups) good quality milk, dark or white chocolate” – does this mean I can either use 450 grams of milk or 3 cups of chocolate? Or does it mean I have to use both? So glad to hear that Josh! It’s such a crowd pleaser! I just made the Oreo truffle filling and realized I don’t have enough chocolate. Is it ok to leave the Oreo mixture in the fridge for longer than 5 -10 mins? I wanted to fi sh this after work tonight. So it would be in the fridge for about 8 hrs before I could assemble it. Absolutely Kelly! That should be fine 🙂 Just leave it out of the fridge for 15 minutes or so when you are ready to assemble to bring it back to room temperature. Hope you love them! Oh thank goodness. I’m getting tired of reading about everyone’s Whole 30 diet right now. This is the antidote! Hahaha SO true! Thanks Jessie! I need this in my life. I recently discovered they have these new little oreo egg things for easter eggs that are somehow gluten free (?!?!??!??? – don’t worry, I checked the ingredient list like 30420340235034 times because I was like "whaaat?!") 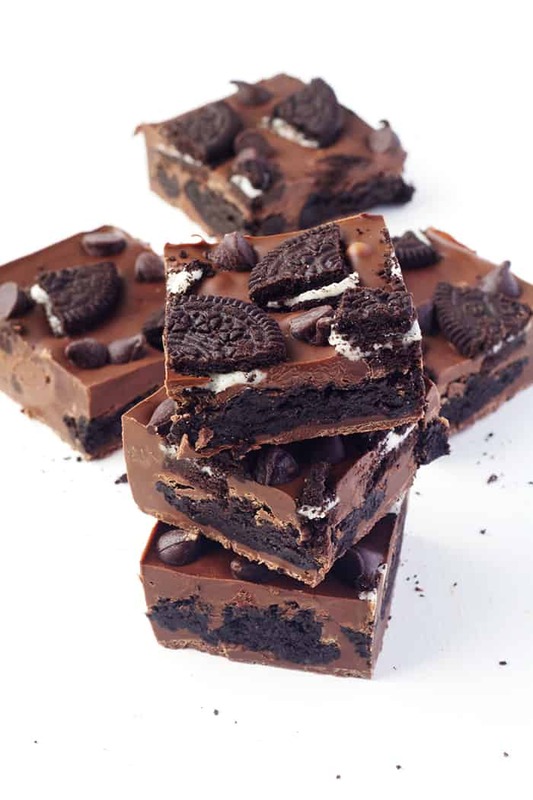 and now I’ve rekindled my oreo obsession and I need to make this with gluten free oreos! Get out of town! I can’t WAIT to get my hands on those Oreo Easter eggs. They sound amazing! And you need to make this girl!! I can’t believe a bar that looks this good can be so simple and only have four ingredients! These would disappear immediately. I think we’re both on the same wavelength with the Oreos today! But I think your truffles bars take the cake, these look soooo good Jess! I think it’s become impossible for me to stay away from this page for more than 48 hours. It’s like an addiction! Every time I stop by, there’s another recipe that leaves me with the world’s biggest sweet tooth and crazy urge to run to the kitchen. This one is no different- love it! Awesome Barry, I hope you enjoy it!